Elvin Birth, The 1779 Western Campaigns, Raleigh: 2003, privately published, "Journals.pdf", p.125. 42.334031 -76.837538, "Markers.pdf" p.83. Wiki: Catharine's Town 42.35, -76.833333 Basis of location. GeoHack: multiple maps for Catharine's Town (from above). 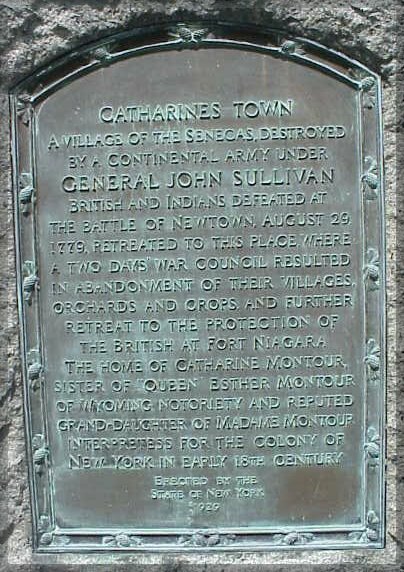 Catharines Town - A village of the Senecas, destroyed by a Continental army under General John Sullivan. British and Indians defeated at the Battle of Newtown August 29, 1779 retreated to this place where a two days' war council resulted in abandonment of their villages, orchards and crops and further retreat to the protection of the British at Fort Niagara. The home of Catharine Montour, sister of Queen Esther Montour of Wyoming notoriety and reputed grand-daughter of Madame Montour, interpretess for the colony of New York in early 18th century. As the infantry were approaching Catharines town ... in a field immediately opposite, where there stood a number of houses also, where we encamped, and substituted the timber of the houses in room of fire-wood. Aug 1779 listing. 8/29/1779 Newtown (Elmira), NY. American victory.